This HowTo will show you the process of downloading areas of the map for offline use. You can download as many areas as you want. You should have a stable WLAN connection. Press the small download button of the big map button. 2) Choose your preferred map provider from the Online page and press the Download-button in the menu. 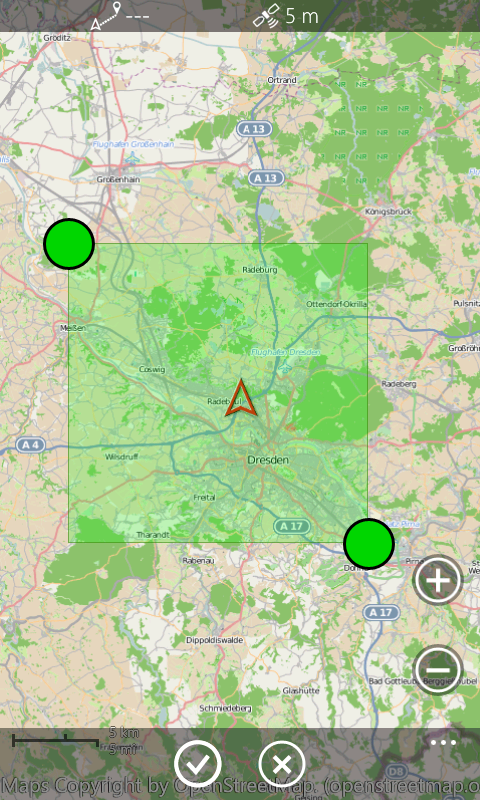 3) Select the area on the map. Drag the two green circles to mark the area. Press the OK-sign button if you want to download this area. 4) Give your download a name and press the OK-button in the menu. You can chosse the maximum zoom-level. Zoom-level 15 or 16 is mostly enough. The download size rises with a more detailed zoom level. 5) The download is in progress now. Do not turn of your phone. Ensure a stable WLAN-connection and connect your phone with a power supply. 6) After you have successfully download the area a new list entry is visible in the Info-page of the Online map provider. 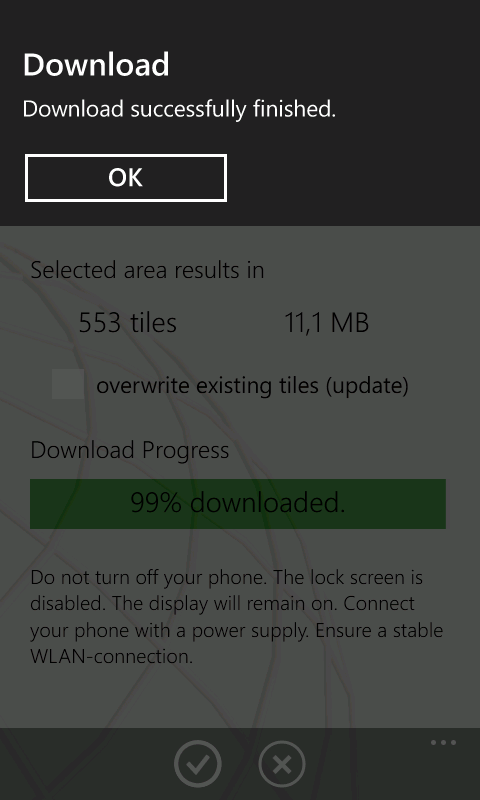 You can delete the tiles covered by downloaded areas. Choose the online map provider from the Online page, press the lower Info-button (i) and select the Downloads-page. Choose the downloaded area and press the Delete-button of the menu to delete the tiles. To use the downloaded area, you do not need to select it. The locally available map tiles are automatically used preferably before they are downloaded online. Jut use the online map as usual. This entry was posted in Maps, Maps - Download by maaloo7. Bookmark the permalink. Thanks for gear apps. I have couple proposal for new features. 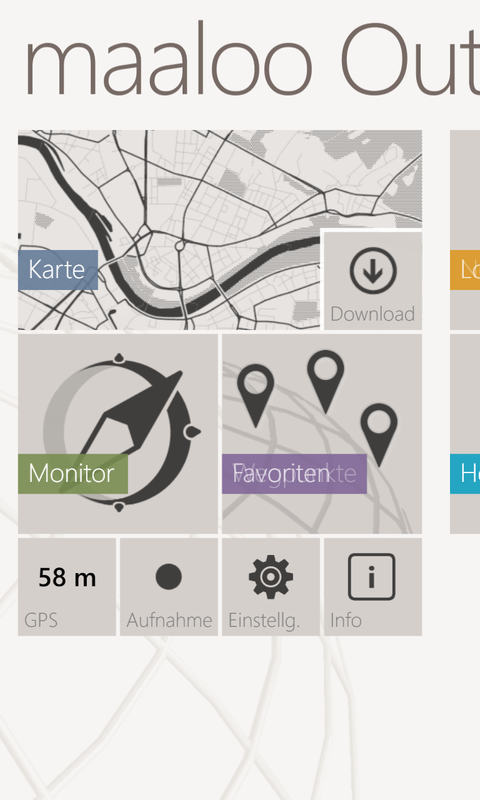 I have several custom maps which I would like to take in use on WP8. Them are originally made for OziExpoler(CE) afterwards converted to OruxMaps. Would it be possible to use these in Maaloo in some day? Yes the integration of the SD-card is planned for this year (Nov’13). I will see how to effectively integrate the SD-card. 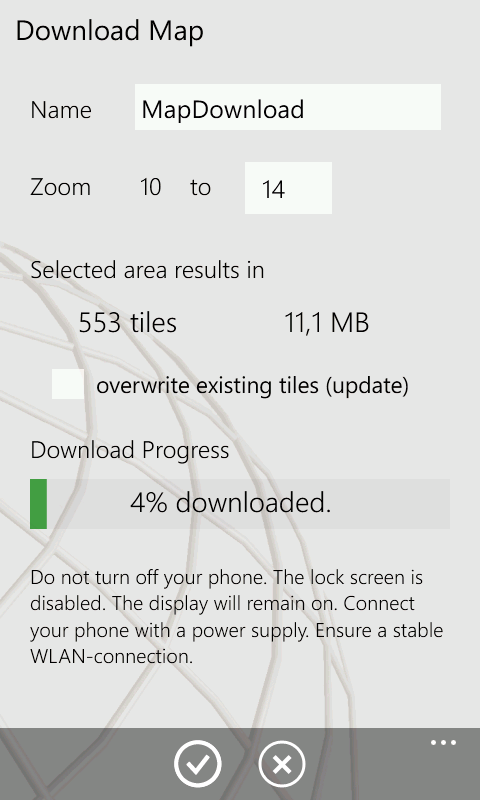 It is also planned to use the Nokia here map on WP8 as map base layer, so you save internal memory if you use this map provider. The map data will be extended with small forest ways of OpenStreetMap-data, to have a more outdoor-feeling with the Nokia/(now Microsoft) here map. Maps will be saved on installed SD card or in the storage memory? Maps are saved in the storage memory. Thanks for this nice app. Download speeds of maps are low. Is this due to Openstreet map server? Yes, this depends on the server you download from. The normal Mapnik-OSM-servers are relatively “fast”. The special-maps like Hike or Cycle are slower. You should download only small pieces of the map, max 10000 tiles per download, to limit the traffic for the servers. The download function should continue working, when you go back to the map. Maybe some kind of neat status bar on the top would be nice. Or on the map like in previous versions. The current handling is a step backwards.